Nigel Wireker (aka Longchamps) was a monk at Christ Church, Canterbury, in the late 12th century, during and after the martyrdom of Thomas Becket. 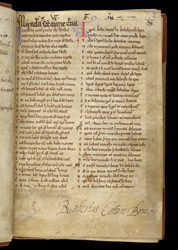 He is best known for his satire on monks 'The Mirror of Fools', but he also wrote religious poetry, preserved in this manuscript, a collection of works from Christ Church, Canterbury, copied between the late 12th and early 13th century. It includes other material such the 'Life of St Paul the Hermit' and chronicles or records of historical events. After the Reformation, the manuscripts in the volume belonged to the British bibliophile, Robert Cotton. The manuscript begins with a copy of Nigel Wireker's poem 'Miracles of the Virgin', which he wrote in the last quarter of the 12th century. This copy probably dates from the early 13th century, and it is prefaced by verses which speak of Nigel in eternal rest, suggesting that it was copied at Christ Church soon after his death.